Have you ever walked into a room and forgotten why you went there in the first place? This happens to all of us, and it’s when we forget our Purpose. We do things for a reason, with a goal in mind. There is something we want to accomplish, an action…and we have our sights set on it. This is our Purpose. A Purpose is always specific. It’s difficult to know what we’ve achieved if the goal is vague. When a goal is precise, then mapping the way to it is easier. Make sure that the Purpose is focused and clearly stated. The Purpose should be measurable so that we can know if it has been reached or not. If we do not achieve a specific Purpose, then we have not achieved the goal, what we intended to do. Either the goal is reached…or it is not. Check to see if the Purpose is realistic, something that can be achieved. A reasonable Purpose can be accomplished, but an unreasonable one cannot. 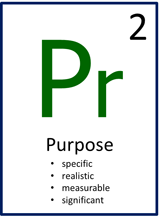 Always ask the question: Is the Purpose significant? Is it something we really care about, something that would make a real difference? If not, then it might be irrelevant and not worth pursuing. Purpose can be accomplished, but an unreasonable one cannot. Purpose helps us to concentrate our thinking. It’s like a laser beam that keeps our thinking focused. Lock your eyes on the Purpose and make that goal.